The entire mountaineering community of the Philippines is so blessed to receive the opportunity to be with a Malaysian Alpinist, Ravichandran Tharumalingam. This month of July Mtr. Ravi will be in Manila to participate to the "Solidarity week" with the Philippine Mountaineering community. 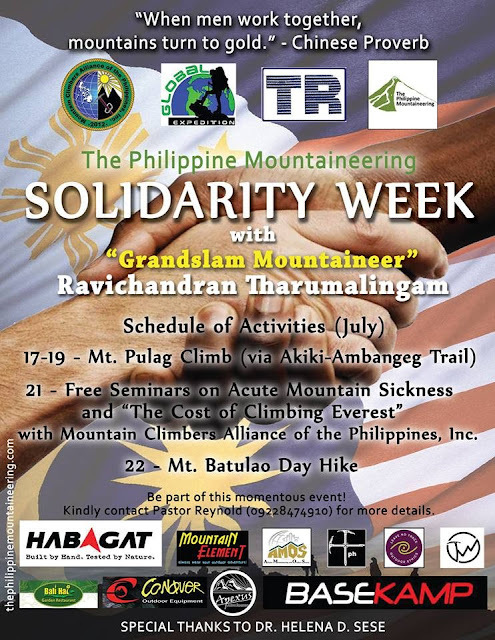 The solidarity week is a seven-day full of events in partnership of thephilippinemountaineering.com and of the Mountain Climbers Alliance of the Philippines, Inc. or MCAP. The said solidarity week covers the two endurance training climbs of Ravi, Mt. Pulag (via Akiki-Ambangeg trail), and Mt. Batulao (day hike) and free lectures for the mountaineering community. Mtr. Ravi chose Mt. Pulag for major climb because of its known cold weather aside from being the highest point in Luzon while Mt. Batulao is known to be the favorite day hike destination of Luzon or Manila-based mountaineers. These climbs aim to help Mtr. Ravi to be in good shape for his coming Mt. Manaslu climb on the last quarter of the year. Mt. Manaslu is the eight highest mountain in the world and one of the requirements for his "grandslam project." Mt. Manaslu is in Mansiri Himal, Lamjung District of Nepal, which is known also to Nepali people as Kutang. The elevation of 8,156 masl (26,759 ft) is revered as the eight highest mountain in the world and one of the toughest mountain to climb in the world. Manaslu came from Sanskrit word Manasa, which means "Mountain of the Spirit". It is said that "just as the British consider Everest their mountain, Manaslu has always been a Japanese mountain" because it was first summitted in May 9, 1956 by Toshio Imanishi and Gyalzen Norbu, members of a Japanese expedition. Mtr. 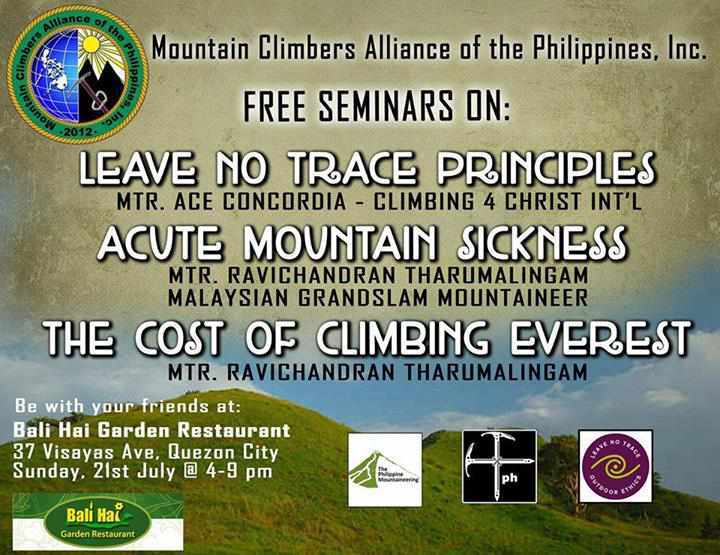 Ravi will be one the lecturers of Mountain Climbers Alliance of the Philippines, Inc. in a day of seminars. MCAP's aim is to develop the leadership potentials of its individual members while seeking to establish better "standards" for the Filipino mountaineering community. The "Alliance" also aims to endeavor to embark on programs and projects that would benefit Filipino mountaineers. These set of free Seminars will benefit every aspirants and outdoor enthusiasts. The first set is the seminar on Leave No Trace Principles with Mtr. Ace Concordia of Climbing 4 Christ International. He is the only Asian Board of Trustee member of the said International institution. On the second set, Mtr. Ravi will share his knowledge on Acute Mountain Sickness and "The Cost of Climbing Everest." May this solidarity week be a fruitful experience for Mtr. Ravi and to the growing Philippine mountaineering community. This is also a good start of the solidarity of mountaineering among South-East Asia.